Announcing our Monthly-Giving Fundraising Campaign! 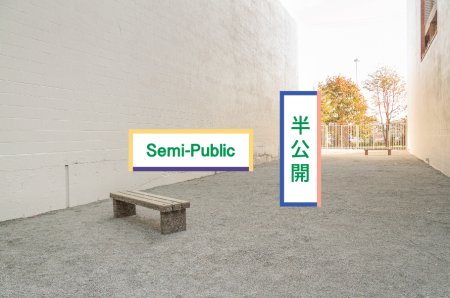 We are pleased to announce our Monthly-Giving Fundraising Campaign for Semi-Public, a 10-year rotating program of public art that responds to the intensive change happening in Chinatown and adjacent communities. We are in the last phase of fundraising and need to raise $800 in monthly donations to complete our fundraising needs. Your ongoing monthly contribution will help us cover 25% of the total program budget per year. Visit our campaign website for more information on Semi-Public and donor benefits. Be a part of the project by supporting us – any amount helps! 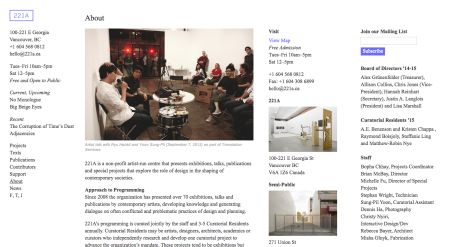 221A is pleased to announce the launch of its new website at 221a.ca. A promotional, informational and archival document designed and developed by Christy Nyiri, the new site features the Times New Roman typeface in a much larger and more legible fluid layout that adjusts to various browser sizes, including mobile devices. The website also includes never-before published documentation in the Projectssection, a series of commissioned texts (to be expanded in coming months) in the Textssection, as well as the new Contributors page, a growing list of the many artists, designers, writers and curators who have contributed to 221A. Please feel free to write us with comments or suggestions on the website at hello@221a.ca. 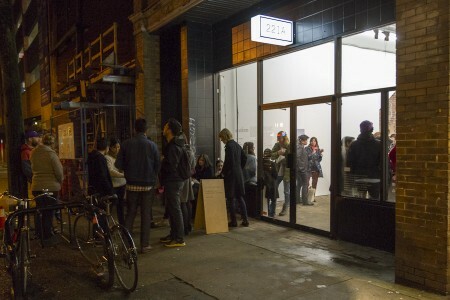 221A is seeking proposals from practicing artists, designers, architects, academics and/or curators, including curatorial collectives, for the 2014-15 Curatorial Residency Program. Started in 2010, the Curatorial Residencies program was implemented to diversify our curatorial approach to our mandate. Residents take on the critical function of working both inside and outside of the organization, offering their experience and ideas towards the continued development of the organization.